The 120+ voice Wholehearted Chorus & Kids Choir are collaborating with Toad the Wet Sprocket lead singer Glen Phillips to bring a wonderfully participatory and uplifting singing event to our community. This is not your average choir concert! We will often invite you to sing along, sharing songs learned by heart, direct from the heart. The same concert will be presented twice, with Glen Phillips joining us onstage for the Sunday concert. Tickets are $10 cash at the door, kids 12 and under are free. Doors open at 6:30pm and early arrival is suggested. Bring cash for a wonderful bake sale supporting the Big Sur Grange. Come out for a potent, wonderful night. Advance tickets recommended ($20), available below. Tickets at the door are $25 and kids 12 and under are $5. A cash bake sale will be offered before the concert and during intermission. Doors open at 2:30pm and advance ticket holders must be seated by 3pm. At that time we will sell any remaining seats to patrons at the door. 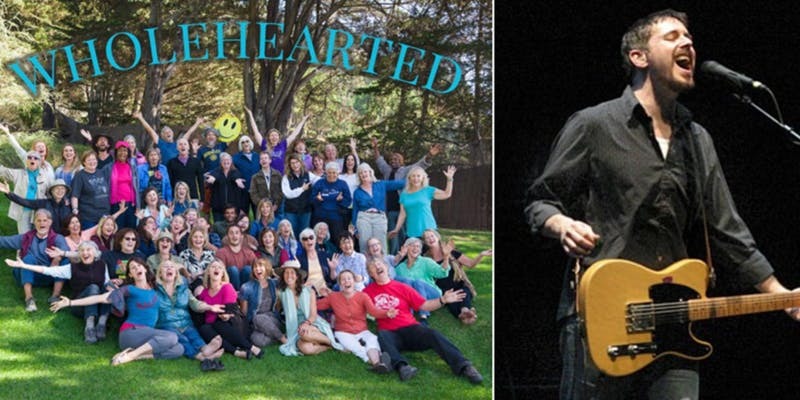 Wholehearted is a non-audition, heart-led, joy-based community chorus with 135 members, ages 6-91, in Monterey & Big Sur, CA. Led by Lisa G. Littlebird, we sing a diverse blend of largely contemporary and original songs from around the world, selected for their ability to soothe, empower and enliven ourselves and the world. Founded in 2008, we are Monterey county’s largest community chorus, and distinguish ourselves from most choirs in that we learn all our songs by heart, in the ancient art of oral tradition. We are open to all who are inspired by the power of song, and welcome you to come raise your voice with us. All songs are learned by oral tradition with no sheet music. Practice recordings and lyric sheets are provided during the seasons to support learning. During the concert seasons we request singers pay for the season in advance, however no singer is ever turned away from Wholehearted for financial reasons. If you would like to sing, pease join us and we will make arrangements with you that fit your needs. Choose the location most convenient for you. Most singers come to one each week but all are welcome at both. Our two communities join and sing together in our season concerts. *NEW LOCATION! * We now meet on Mondays at the Monterey American Legion near Veteran’s Park, 1110 Veterans Dr, Monterey, CA 93940. We meet at the Big Sur Grange Hall. The Grange is located on the west side of Highway 1 just south of the Big Sur Roadhouse. Our chorus never turns away a singer for financial reasons. The scholarship fund allows us to welcome all singers, and your support is creating a circle of generosity… thank you! Our singing tribe is sustained through subscriptions of our singers. If you wish, you may become a regular, ongoing subscriber instead of paying drop-in and season fees. Your subscription is a wonderful support to our chorus – thank you! Singers who can’t join us often may become honorary subscribers. Subscribe with Paypal here or make a one-time annual payment with Lisa. Annual rates are: $60 Honorary, $780 Standard, $1200 Legacy. For out-of-town singers who want to participate in our circle. Just show up! Wholehearted is open to men and women 14 and over. (See our kids choir page for younger members.) No experience or audition is ever required. We meet year round on most Mondays at the American Legion Hall in Monterey (1110 Veterans Dr, Monterey, CA 93940) and Wednesdays at the Grange Hall in Big Sur. During our spring and fall seasons we sings songs that take more time to learn so we recommend more consistent attendance. Drop-ins are always welcome as well. WHAT'S THE COMMITMENT TO JOIN THE CHORUS? The Wholehearted Chorus requires no commitment, although consistent attendance will support your learning and greatly contributes to our sense of community. If you wish to sing in the concerts at least 50% attendance is requested. Singers who come consistently are requested to contribute an up-front donation of $250 for each season. Scholarships are available upon request for singers in need. Singers are also welcome to drop-in and offer a cash or check donation per class. CAN I STILL JOIN IF I CAN'T COME EVERY WEEK? Yes! There are no attendance requirements. You can use the practice recordings to support your learning if you miss meetings and still want to sing in the concerts. We do request that you endeavor to come as often as you can though, as it significantly assists our sense of community. Singing in the concerts is optional. CAN I STILL JOIN IF THE SEASON HAS ALREADY STARTED? Yes! If it is within the first six weeks of the season or so, please come join us. If we are more than halfway through the season, it may be too challenging to get up to speed on all the material, however if you are an experienced singer you may have no problem with the help of our season practice recordings and I welcome you to come give it a shot. I DON'T WANT TO SING IN THE CONCERTS OR COMMIT TO THE SEASON BUT STILL WANT TO SING! WHAT DO I DO? Please drop in! You are very welcome to join us for our season classes on a drop-in basis. The first half of the season is the ideal time for new singers to join us, or at the drop-in classes between the seasons. If you drop in or join us more than halfway through a season it may be more challenging to keep up with our learning. DOES IT MATTER IF I COME TO BIG SUR OR MONTEREY CLASSES? 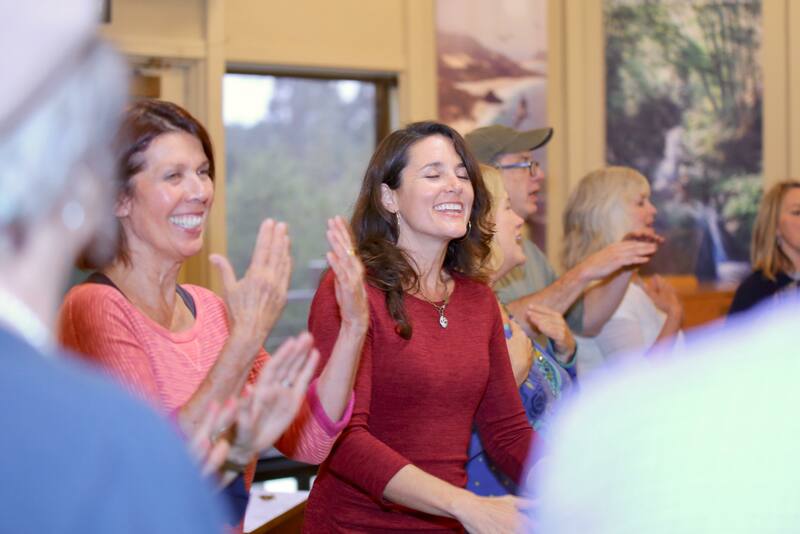 Singers are welcome to attend the Monterey (Monday) or Big Sur (Wednesday) classes, or both. Your season contribution covers them all. Visiting the other tribe is fun and encouraged. Both groups sing together at the retreat and concerts. We sing songs from a wide variety of genres, but they are largely contemporary and original songs in English and 2-4 part harmony. All songs are learned by oral tradition, with no sheet music. We sing a diverse mix of traditional chants & rounds, spirituals, gospel, folk, pop and original compositions. During the fall and spring seasons we use lyric sheets and practice recordings to support learning. DOES WHOLEHEARTED MEET BETWEEN SEASONS? Yes! Lisa offers drop-in classes each week all year round – on Mondays in Monterey and on Wednesdays in Big Sur. Check the calendar for the schedule and details. WHERE DO I JOIN THE FACEBOOK & MEETUP PAGES? WHEN DO WE GET OUR PRACTICE CD'S? Songs with recordings of individual parts will begin being posted on the website early in the season. Custom practice CDs become available about halfway through each season.